Install Azure PowerShell Cmdlets V0.8.0 or above from here. If the scripts will be run on an existing VM, make sure VM Agent is enabled on the VM, if not follow this blog post to install one. Upload the scripts that you want to run on the VM to Azure Storage. The scripts can come from a single or multiple storage containers. The script should be authored in such a way that the entry script which is launched by the extension in turn launches other scripts. Now that you have the necessary pre-requisites, let’s walk through a few use cases to show how these cmdlets can be used. 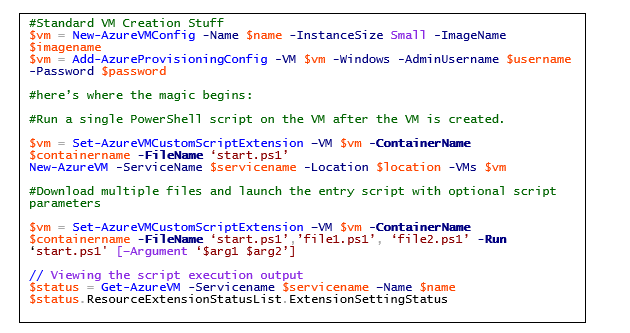 The current version of this extension targets PowerShell cmdlets only but in future this can be expanded to other scripts. Use Case 1: Uploading files to a container in the default account. If you have your scripts in the storage container of the default account of your subscription, then the cmdlet snippet below shows how you can run them on the VM. The ContainerName in the sample below is where you upload the scripts to. The default storage account can be verified by using the cmdlet ‘Get-AzureSubscription –Default’ Note: This use case creates a new VM but the same operations can be done on an existing VM as well. Use Case 2: Using non-default storage accounts. This use case shows how to use a non-default storage either within the same subscription or in a different subscription for uploading scripts/files. Here we’ll use an existing VM but the same operations can be done while creating a new VM. Use Case 3: Uploading scripts to multiple containers across different storage accounts.